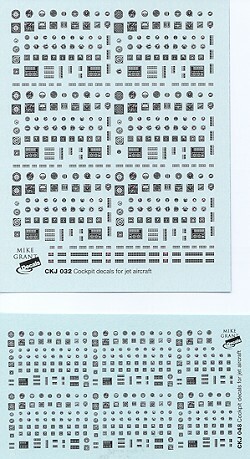 The latest goodie from Mike Grant Decals are these sheets for jet instruments in 1/32 and 1/48 scale. While there have been similar decals in the past, none have come to the level of detail that Mike Grant has placed in these sheets. As you can see from the enlargement of a section of the 1/48 sheet, the quality and resolution of these decals is very impressive. These are ALPS printed decals so are on a single carrier that requires each marking to be cut out. There are a goodly number of different dial and strip indicators for just about any jet from around the mid 1970's onward. There are also some switch panels and instrument groupings provided. All decals have white backings so no additional prep is required before use. Though designated as 1/32 or 1/48, many of the smaller dials would be applicable to smaller scales. These are excellent decals and you should seriously consider obtaining a few sheets of each for your next project. Mike Grant Decals can be purchased via his web site at the link below. Review copy courtesy of Mike Grant Decals. Thanks for your support. If you would like your product reviewed fairly and quickly by a site that has around 300,000 visitors a month, please contact me or see other details in the Note to Contributors.